A Prehistory of South America is not a pop-science book. Instead, it was written as a book for undergraduate archaeologists and those who are quite interested in Latin American history and archaeology. As such, it is well outside my usual reading habits. First things first: "prehistory", as used by the author, means pre-European-conquest. This is because once Europeans arrive, they write the history of their own actions, and even record some information about the locals they find (albeit much distorted by their own biases). Before Europeans, the societies and civilizations that lived in South America did not chronicle their own histories in a way that can still be read by today's historians. What forms of writing and recording there were (besides oral histories) are largely impenetrable now: some civilizations had hieroglyphic records, others used systems of strings and knots (the khipus in the Andean areas), others used stylized pictorial art to convey meaning and myth to the initiated, but each of those records is far removed from written language. Therefore, the knowledge we have of pre-conquest societies is fluid, subject to new discoveries, and incomplete. Jerry Moore argues that archaeology has to take the lead in revealing information about these societies: the oral histories that reached conquistador chroniclers are insufficient, partially because most of the conquistadors weren't even trying to be unbiased, and partially because the oral history was incomplete and equally biased. 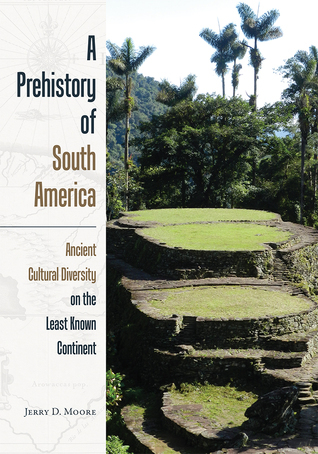 A Prehistory of South America is probably the closest thing to the book I was hoping to find. What I really wanted was a sort of encyclopedia, organised on a timeline, with plenty of maps, telling me which societies lived where, how they lived their lives, how they were organised, and how they developed, over time, from the first arrival of man until the arrival of Europeans. Unfortunately, it looks like that is not actually possible, as the knowledge simply does not fully exist yet. Instead, the book is organised into chapters which look at different aspects. Say, the arrival of humans. Or the rise of agriculture and different methods of subsisting and exploiting natural resources. Each chapter uses a handful of case studies from across the continent, and none of the chapters are bound purely by chronology. So a society living 3000BC and a society living 800AD may be showcased in the same thematic chapter, despite the huge gulf in time (and location) between them. At first, I worried this way of looking at things would be chaotic to my brain, but actually, it works very well. Even at 500+ pages, the book can only offer a cursory look at each society and each civilization. Fortunately, the book is richly illustrated with photographs, maps, drawings, and academic references to give the reader a clearer idea what is being described, and where to go for more in-depth information. It is written in a style that is clear, generally accessible despite being somewhat academic, and the author always makes clear how certain a bit of knowledge is, or where alternative theories are still not settled. In short, the book is fantastic starting point for finding out about the history of pre-colonial South America - which is a mindbogglingly fascinating topic. Unfortunately, it is not (and cannot be) The Ultimate Reference about that topic, because the research is still in its infancy. It is a fascinating book. I highly recommend it. Addendum: I read the book, and am reading around the topic, to research for a fiction project I am hoping to write soon. My interest was piqued by a superb TV series - Lost Kingdoms of South America - which is jaw-droppingly exciting and intriguing. I would recommend watching the programme in combination with reading this book, for a more immersive experience. Sadly, one of the peoples I am trying to find out more about - the Chachapoya - is barely mentioned in this textbook. Oh well, more reading to be done!